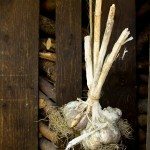 Can I plant store bought garlic and plant cloves as they sprout in the kitchen? My garlic cloves from the grocer are sprouting. How can I take advantage of this?